Stellar Four: Hogwarts Is Here! Are you a muggle that's always been a little sad that your Hogwarts letter never came? Did you get sorted at Pottermore, only to be disappointed by the site's lack of anything to really do? Well friends, you are in luck because Hogwarts Is Here! Hogwarts Is Here is an incredibly ambitious fan project that dreams of a digital Hogwarts designed like an online college. Finally embracing the digital age, Hogwarts has made it's courses available online so muggles can gain the same education as their wizard friends. You receive your own Hogwarts acceptance letter and a whole schedule of courses. There's no sorting involved, you pick your House and work to gain points. I'd be remiss if I didn't mention that my house, Slytherin, is currently leading the point total for House Cup. 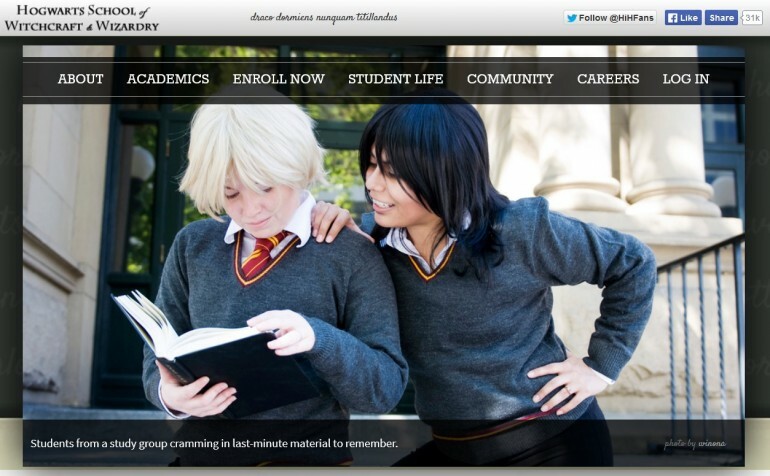 What makes Hogwarts Is Here stand out from other fan projects is the fact that you actually have to take the classes! You can't advance in the game without doing homework, writing essays and taking tests! That sound you just heard was one Hermoine Granger fainting from sheer overwhelming joy. That's right, when you sign up to become a student at Hogwarts you REALLY become a student. You're given books, dorms and a class schedule. None of the courses are exactly strenuous though they can be challenging. My day has been spent getting texts from my sister complaining that she got a C on her Potions quiz and lost her house points (she's a Gryffindor. I'm the black sheep of the family). If you progress enough with your classes you even get the opportunity to take your O.W.L.S and N.E.W.T.S! When you become a third year, you can also begin to write for the school paper, the Daily Owl! Like any website that involves being even vaguely social, you get a profile page and your points and scores are displayed proudly. Besides the classes, you also get to set up a Gringotts Bank account and buy books, potions and wands. The site is free so the money is as imaginary as your degree will be. The site is being hammered right now by all the activity as people sign up to begin their illustrious wizarding careers but it's worth the wait! After an influx of publicity from muggle publications like Slate, Buzzfeed and Mashable they are adding additional servers and professors to handle the load of new prospective students. Join other wizards and witches and get ready to do some homework! Harry Potter fans are the best fans because we find doing fake home to be incredibly exciting. Now, if you'll excuse me, I have a three hundred word essay for Defense Against the Dark Arts class due. My husband warned me that the installer has malware, so be careful. Their ad host is unfortunately displaying false "download" pages. You do not need to download anything to play Hogwarts Is Here. I believe they got rid of that ad host. That is too bad, because it is already on a bunch of game review pages that it has malware. But I'm off to try the game! If you are looking for some college help websites, you got to check out this source.